I chose this Proverb for today because it challenged me, and reminded me of where I'm coming from.... where I want to go to. 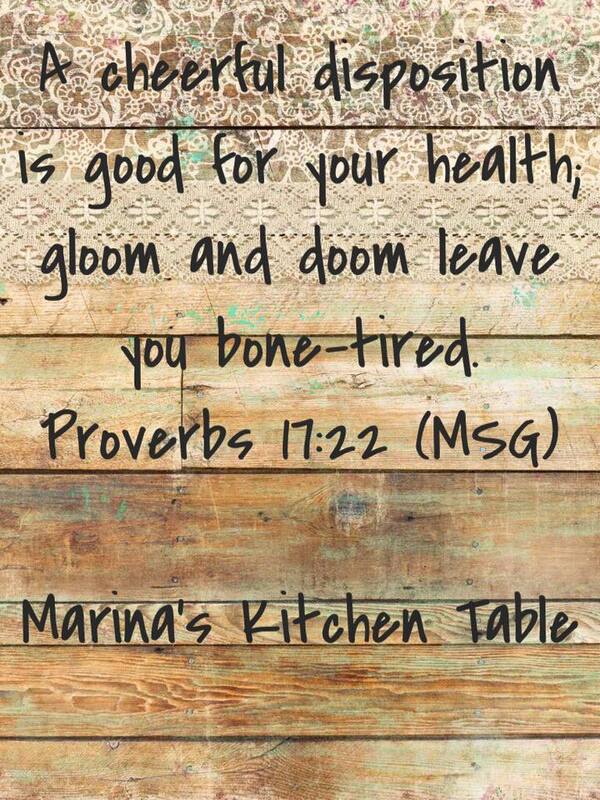 Negative speaking and thinking WILL leave us "bone-tired" as this translation describes it. but a broken spirit saps a person’s strength." Not only is it what we think up ourselves (oh, how hard we can be on ourselves! ), it's what we make of other's opinions of us, or what they bring to us; either as a gift (a cheerful heart) or as they pile their stress and negative junk upon us. It's one thing to help a friend carry a burden in prayer, it's another thing when that's all they ever offer you. It gets tiring, it wears us down, and to the point that we can't be effective in friendship or praying. I have had an issue with this in my own life... people have broken my spirit, knocked me down, kicked me while I was there - and then they get over their circumstances and move along, but don't understand why I'm hesitant to spend time with them. Even when I forgive them for their hurtful words and actions towards me, I have to be careful to not allow them to abuse me this way again. With technology today, it's easy to get a dose of laughter. Watching or listening to comedians online is easy and free! I like anything from Jeanne Robertson and some of Brian Regan's humor and I'm a fan of Bored Shorts TV. Some people like to watch one of the funniest home video shows out there, while others like to watch stupid pet tricks... it really doesn't matter what makes you laugh... JUST DO IT! You'll find yourself renewed and energized! I love to spend time with my grandkids! They bring me JOY in some of the purest ways. I love the silly things they say and do, and it renews my spirit, even if it wears me out physically! If I can't sleep well, a good remedy is to watch my grandkids for a few hours in the afternoon - they lift my spirits and leave me EXHAUSTED!! Even "fake laughing" will trick our bodies into creating the healthy, positive hormones that we need to make us happier! Laughter truly IS the best medicine! Please share what makes you laugh! !